Professors Nikos Donos and Irwin Olsen and Mr Harsh Amin from the Eastman Dental Institute, UCL have recently discovered that two peptides derived from the developmental protein amelogenin can modulate adult human stem cell development (UCLB patent no. PCT/GB2010/002310) and have manufactured small molecule versions. One appears to strongly stimulate osteogenesis, while the other stimulates blood vessel growth and possibly nerve cell development of adult human progenitor/stem cells in vitro. Proof of concept has been completed using a range of adult human primary cells containing a progenitor/stem cell-like population, and blood vessel regeneration has also been confirmed in an ex vivo model. The research team will soon be testing the potential efficacy of these new drugs using in vivo models. 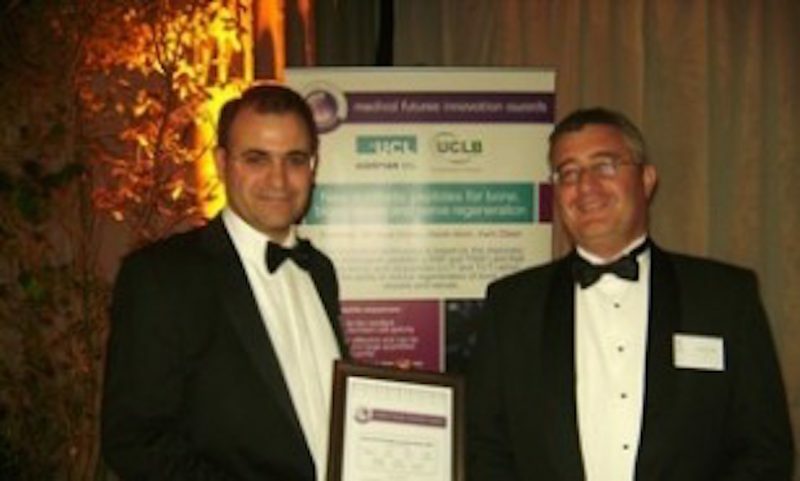 While current commercially available therapies such as autologous bone grafts and growth factors for tissue regeneration are expensive, often unpredictable and can have a number of adverse consequences, the new UCL peptides are small in size, can be produced relatively inexpensively and could readily be modified to target specific diseased or damaged tissues within the body. In addition, while certain safety issues have been raised about stem cell transplantation procedures, the peptides discovered by the UCL team provide potentially valuable and safe options for effective clinical therapy. UCLB is responsible for commercialising innovations arising from the research base at UCL, one of the UK’s leading research-led universities. UCLB undertakes a broad range of knowledge transfer activities, covering the facilitation of consultancy and collaborative research engagements through to technology transfer, company incubation and investment. The UCL Eastman Dental Institute is recognised internationally as one of the leading centres of research and postgraduate education in the field of oral healthcare. The Institute is a vibrant community of clinicians, scientists and allied staff focused on a central mission: to promote oral health and wellbeing by advancing knowledge of the causes of orofacial disease and the prevention, repair and regeneration of resultant tissue abnormalities, and to translate such findings into clinical practice. Through the accomplishment of this mission the Institute is committed to advancing oral health provision in the UK, Europe and worldwide. The Unit of Periodontology at the UCL Eastman Dental Institute, of which Professor Donos is the Head and Chair, focuses on preclinical and clinical research on wound healing related to tissue regeneration, as well as on the association of periodontal disease with other chronic diseases. to find out more, please visit the website.